An Update on ConFusion 2018 and a Party! Here’s a little bit about what is happening for ConFusion 2018. We voted and the theme that won was: ConFusion Through The Looking Glass. So prepare yourself as we take a trip to Wonderland but don’t be late or it may be off with your head! The hotel is confirmed! We will be returning to the Sheraton for January 19-21st of 2018. We are working on getting a link for hotel reservations. We will post again when that link is available. Thank you for patience. 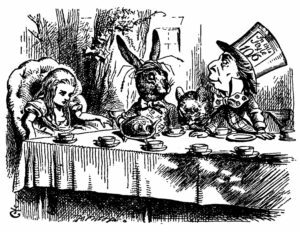 In the meantime, if you are missing out on the ConFusion fun or would just want to get a jump on the theme for 2018, come and join us for The Mad Hatter’s Tea Party we will be holding at Penguicon on Saturday night the 29th. For more information on Penguicon click on the link below. Till next time a very merry un-birthday to and yours!